When considering a home purchase or any other major investment, you should be armed with the best information possible. Our inspections enable you to get a thorough assessment of the structural and functional condition of all the major systems of the property. From the air conditioners to the roof to the fireplace, we want you to have the best possible picture of the property you are considering. Current homeowners often use home inspections to identify potential problems which may need preventative maintenance or servicing. This can be helpful to avoid surprises when selling you property and establish compliance with disclosure laws. Many buyers of new homes call us back to check for conditions that may be covered under their initial warranties. Having a formal inspection completed can help in the discussion with warranty companies. Even if you have a construction background, this can be a slippery slope. Many times buyers spend weeks or months trying to find “the perfect home”. This can cause them to jump at the chance to purchase a house that meets all their qualifications but has costly underlying issues. Having an inspector who is objective and unemotional about the process can eliminate the potential to overlook problems and give a thorough analysis of the property. NO! 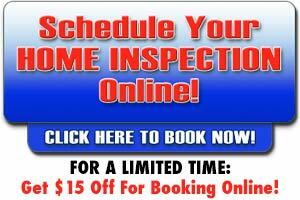 A professional home inspection is not a PASS/FAIL inspection. We do not produce an appraised value of the home or document its compliance with municipal codes. We are there to give you a structural and functional analysis of the major systems like the air conditioning, roof, and foundation. We love it when our customers meet us at the inspection site. Many times our customers have only briefly been inside the properties, and some have only seen them online, so this is a good chance to walk around, measure, and plan the perfect arrangement of your furniture. We are there to give you the full picture of the house, both its strengths and weaknesses, and the more questions you have the better. We want you to leave fully informed and confident about the status of the property. It is important to remember that you, the customer, hire the inspector. No one else, including realtors, sellers, or other professionals involved in the purchase will receive the report unless we have you express written permission. In contrast to the cost of the cost of repairs, the price of an inspection is very reasonable. Consider the value of spending around $300 for an inspection that uncovers a $5000 repair need in the plumbing, HVAC, or foundation systems that may not have otherwise been found. This information is well worth the price. Price isn’t everything, however. Remember the rule that “YOU GET WHAT YOU PAY FOR”. If someone offers you an inspection that is far less than the average cost you may need to investigate further and find out why. It would be very unfortunate to “save money” on the inspection then find costly unreported problems after you move in. We take our time and pay strict attention to detail. Because the information in the report can be confusing or intimidating to some buyers, we take pride in giving our customers a clear understanding of the conditions by including pictures and reviewing the actual report onsite. We recommend asking as many questions as necessary during this review and we stay available after the inspection if you need further clarification.